All too often we imagine our hominid ancestors as hairy and primitive cavemen, living under the law of club and fang – unruly monsters that were more primate than human. The evidence, however, is painting a much different picture. Not only were other species of humans like the Neanderthals and Cro-Magnons capable of crafting tools and speaking languages, but human evolution in general likely brought about compassion and kindness some time before producing the intelligent beings of today. Throughout history, we’ve thought of ourselves as the products of an evolutionary process grounded in intellect – only the brightest and the strongest spawned descendants, with each successive generation better than the last, the eventual outcome of lifeforms that became gradually more complex. However, according to a new study led by researcher Penny Spikins, from York University, this isn’t an entirely accurate assessment. 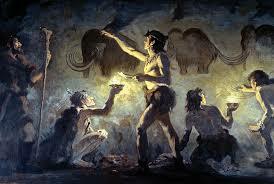 According to Spikins, there were at least three groups of the earliest human ancestors that exhibited altruistic behavior, developing some time before early humans showed evidence of intelligence and speech, concepts that are only about 150,000 years old. Australopithecines, the species of ape to which Lucy belonged, were the first of our ancestors to walk upright, and lived in South Africa some three million years ago. Another 1.5 million years after Lucy, and there is archaeological evidence that our close relative Homo ergaster lived in tribes that took care of their sick. There is also the Homo heidelbergensis, which lived about 450,000 years ago, and is thought to have raised disabled children to maturity. Spikins published her research in the new book How Compassion Made Us Human. Another piece of her evidence is a 250,000-year-old axe which was decorated with a fossilized scallop – already, humans seemed to have developed their own sense of aesthetics and beauty that they recognized in nature well before they began cave paintings of their own. “Compassion is perhaps the most fundamental human emotion,” she added, but hardly unique to modern homo sapiens as we might imagine. “It binds us together and can inspire us but it is also fragile and elusive. This apparent fragility makes addressing the evidence for the development of compassion in our most ancient ancestors a unique challenge, yet the archaeological record has an important story to tell about the prehistory of compassion.” Far from clouding our judgment, it made building social networks possible in a dangerous and unpredictable world. Spikins was previously involved with research on Neanderthals, published in the Oxford Journal of Archaeology. While she does not deny that the mountains of the Neander Valley was a harsh climates to grow up in during the Ice Age, with geography that often led to isolation, the small families of Neanderthals were actually fairly close to each other. They buried their dead and their children played games which developed the skills they would later use to function as members of the tribe. Not only did parents care for sick or injured children, but child graves were marked with much more distinction than those of tribal elders. “There is a critical distinction to be made between a harsh childhood and a childhood lived in a harsh environment,” said Spikins of her work – an important thing to consider when we imagine what our ancestors endured growing up in the Paleolithic Era.